Whether your employer requires you to get steel toe boots or you are safety conscientious enough to want them, you can find the boots you need here because we have a wide selection to choose from. As important as it is to find a style and brand that suits your taste, there is more to choosing work boots than the way they look. Before you make your selection, consider the work environment you intend to wear them in. List the potential hazards and discomforts that threaten your feet on the job, and find a pair of boots that give you the protection you need. Here at Safety Shoe Distributors, we sell steel toe boots that have many different features, so you can purchase boots customized for your work environment. · Metatarsal Protection – As important as your toe protection is, you should also think about protecting the rest of your foot. Metatarsal protection keeps your feet safe in the event that a heavy object falls on them. · Slip Resistant – Same-level slips and falls constitute one of the most common workplace accidents. A fall does not have to be from a great height to injure, and slip resistant boots are an important way to protect yourself from any slick flooring conditions. · Static Dissipating – Anyone who works with electronic equipment may benefit from static dissipating boots. These boots protect both you and your equipment by reducing the static electricity you gather from the floor. Whether you want steel toe boots that have the specialty features discussed here, or you have different needs, trust us to help you find the best boot for the work you do. Browse through our fantastic selection, then buy your new boots here or at one of our many locations. If you have a group order, you can also request our mobile shoe store, and the Shoemobile will come to you with a wide selection of the types of boots or shoes that your group is interested in. Need work boots, but you're not sure what to start? The first thing you need to think about is your work environment. Do you work in a construction zone? A restaurant? Perhaps in a wet ourdoor environment? •	Which type of work shoe or boot will the best for your work environment? •	What brands should you consider to best suit your work needs? 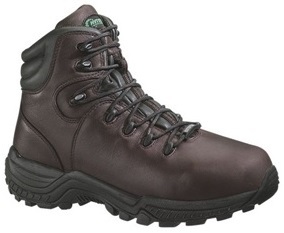 •	If you work in outdoor construction, you'll most likely need waterproof steel-toed boots. •	If you work with heavy machinery and do a lot of walking, you'll need comfortable steel-toed boots. •	If you work in a restaurant, you'll need comfortable non-slip shoes. When it comes to brands, if you need high-quality steel-toed or industrial work boots, consider Hytest or Timberland boots. These brands will ensure durability, stability, warmth, and will be long-lasting. If you need a good pair of soft-toed non-slip shoes to wear at the restaurant, Hytest is also a great choice. Hytest has made a name for itself for producing comfortable yet flexible non-slip shoes. A steel-toe boot (also known as an industrial boot, steel-capped shoe, steel-toed safety shoe and many other variances) is a durably-made boot or shoe that has a protective steel insert in the toe. It is made tough to withstand several pounds of pressure from a falling object (for example) or compression of an object. It is also usually made with a mid-sole plate to further protect again punctures from objects. Read our "facts you probably didn't know about steel-toed boots" to learn even more about this magnificent invention. Steel-toed boots originated in Germany, and were invented at the end of World War II. Some steel-toed boots are actually made with composite material reinforcement, a plastic such as thermoplastic polyurethane (TPU) or even aluminum. Some steel-toed boots are not boots at all. Styles have changed over the years, and some manufacturers even make steel-toed sneakers and clogs. Steel-toed boots are meant to last for several years. They are built tough - meaning they won't fall apart in a couple of years like most sneakers do. Some steel-toed boots can even protect you against a chain saw. How crazy is that? These boots are specially marked and are sometimes called "chainsaw boots." All steel-toed footwear must go through vigorous OSHA compliance and licensing before hitting the shoe stores. In most cases, non-slip (or slip-resistant) safety shoes are required by the Occupational Safety and Health Administration if you work in any of the jobs we listed below. Worker safety is extremely important, and should be on the mind of employers (and employees!) at all times. Non-slip shoes are worn to reduce or eliminate the possibility of slips and falls while on the job. Most non-slip shoes can prevent slips due to oil, grease, water, and many other types of liquids. This is probably the #1 place people think of when they think of jobs that require slip resistant shoes. Restaurants and other food service industries are notorious for having unpredictable floors. Employees can also benefit from employers treating their floors with applications that create safer surface traction and greater resistance properties. Employees working in the roofing industries will especially need non-slip shoes due to the dangers when climbing ladders, working on different roof surfaces, and because they’re exposed to the outside weather. A good pair of non-slip shoes can mean all the difference when it comes to a good day’s work or a very serious injury. Employees and individuals who clean houses, offices and other buildings for a living are often required to wear non-slip shoes because of the dangers of cleaning while mopping, or working in the kitchens or bathrooms, etc. For those who aren’t required to wear, they should be considered to prevent the possibility a fall or injury. Many food processing types of jobs require employees to wear slip-resistant shoes due to the back-and-forth traveling across hard floors that can be wet. Some employers consider adding slip-resistant coating to the floors, but that’s not alternative to non-slip safety shoes. We carry non-slip shoes at all of our retail safety shoe stores: Bootworks in Louisville, Kentucky; Footworks in Cincinnati, Ohio; Footworks in Decatur, Illinois; Footworks in Indianapolis, Indiana, Footworks in Columbus, Indiana; Footworks in Northern Kentucky; and Footworks in Pittsburgh, Pennsylvania. For a list of our store locations and addresses, click here. There are some things to look out for when buying safety shoes. In order to verify you’re making a good buying decision, and to make sure you’re buying the type of shoes that fit your needs, we’ve come up with a list of things to check for before making the final decision. 1. First thing is first – if you’re looking for safety shoes for work, what kind of environment do you work in? For example, if you’re in the field of heavy construction, steel toed boots are best. If you work in the Louisiana bayou, on the other hand, you’ll want a pair of waterproof shoes. But there are the types of jobs where you might need steel toe shoes and waterproof shoes, so keep this in mind. We actually do carry multi-purpose shoes—in fact, most of our shoes are multi-purpose. If you’re unsure of the terms or what type of shoes you might need, on the other hand, we advise doing a little bit of research on our previous blog posts or checking your information against our safety shoes legend. 2. After you’ve decided what type of safety shoes you need, you’ll need to do further research on how durable the shoe is. This usually depends on the particular brand and model of shoe. There are many reviews online that provide reference points, or you can try contacting us with any questions you might have on durability. 3. Make sure that the safety shoes you want will fit correctly before purchasing a pair. Shoes of different brands and types will fit differently than your every-day sneakers. It’s very important to find shoes that fit correctly when you work a job that requires you to be on your feet for 8 or more hours each day. Also remember that with steel-toed shoes, your toes are not supposed to touch the steel. This can lead to foot injuries—it isn’t just about discomfort. We can’t stress this point enough. 4. Don’t be uncomfortable with asking questions. Whether you’re buying online or in-store, ask questions when you’re unsure of the right size for you, when you’re unsure of a certain brand, or if you’re unsure of what type of shoe does what. 5. Check for coupons, deals and/or special promotions if the safety shoe you want and need is at a higher price point. We have sales going on at our many store locations here in Ohio, and in Kentucky, Illinois, Indiana, Pittsburgh and Kentucky…check us out! Want to keep your steel-toed boots in a good working condition? Not sure what kinds of socks go best with them? Keep reading if so—we’ve put together a list of products that go hand in hand with safety boots. 1. Bottle of Kiwi Rain & Stain Protector – It’s in the name – this spray bottle will protect your leather, fabric, suede or nuback shoes or boots from the rain and from stains. It works well for all colors and allows boot and shoe material to breathe. 2. Bear Leather Dressing Grease – This product is similar to the above one, but it is manufactured specifically to preserve the leather in shoes. It comes in 3.5 oz cans. 3. Work Socks – this is a simple solution to all-day long comfort at work! Choose from FoxRiver, Mega Comfort, PowerStep and more. These socks are tailored specifically for protecting hardworking men and women and are perfect for steel-toed boots or shoes. 4. Mink Oil Protectant – It’s not only an oil protectant, but it also conditions and waterproofs leather. It’s designed to keeps leather soft and supple. 5. Kiwi Order Control Dispenser – This all-day dispenser will protect you from any smell your foot can dish out. It’s designed in an upside-down bottle, so you can dispense it in the front or back part of the shoe. Keeping your toes and feet safe should be of the utmost importance to you while working. Whether you work in construction, in a heavy manufacturing field, in a laboratory or somewhere else where your feet could be in danger, finding the right type of safety shoes before you go on site will be required under standardized health standards and therefore by your employer. If you work with equipment that could fall on you without a moment’s notice and you weren’t wearing steel-toed boots, the worst could happen. Moreover, it could impair your ability to work, and it could be fatal, too. Steel-toed boots are made to withstand several hundred pounds of falling pressure—keeping your feet safe and sound while working. For your protection, we’ve put together a store that has it all: we carry steel-toed boots, alloy-toed shoes, composite-toed shoes, slip-resistant shoes, waterproof shoes, metatarsal shoes, electrical hazard resistant shoes, and more. Be sure to check out our legend on the left side of the homepage and the product description on each product to make sure you are purchasing the right type of shoe or boot for you. What are the Differences Between Steel-Toed and Composite Toe Shoes? Composite toe shoes are similar to steel toe boots, but they are not the same. They are both designed to protect your toes and meet the same ANSI standards. As the name suggests, instead of steel, composite toe shoes have a type of composite material in them. These composite materials are usually a combination of plastic, Kevlar aramid fiber and carbon fiber. People who work in construction or with electricity are normally required to wear steel toe boots or shoes by their employer, but they may run into issues by wearing them. If your employer also requires you to pass through a metal detector to enter your workplace, for example, but you’re wearing steel-toed boots, doing so wouldn’t be possible. If you are allowed to wear composite toe instead, that would pose a simple solution for passing through the metal detectors. Examples of jobs that require the use of metal detectors and composite toe or steel-toed boots might include airport security and laboratory personnel. The composite toe shoes on our site come in many different styles, brands and sizes, to give you a large selection of this type of safety shoe. All composite toe shoes are marked with the symbol shown below. Here at Safety Shoes Distributors, we have several different styles of men’s and women’s slip-resistant (non-slip) safety shoes. It’s our goal to make it simple for you to browse our selection, or to filter your search results by choosing your gender, the shoe brand, color, style or shoe type (i.e. composite toe, soft toe, steel toe, etc.). It’s difficult to develop non-slip shoes because there are so many variables when it comes to slippery surfaces. What makes the floor or ground slippery? Surfaces can be muddy, greasy, wet, oily, or just newly-polished. Additionally, surfaces may have any number of material or debris on it. Whatever the case may be, you have to be able to control the surface below your feet. Because of all the different kinds of slippery surfaces, there is not a single standard on non-slip shoes. However, we provide several different brands of non-slip shoes to really fit your needs in your work environment. If you have any questions about your particular environment and which safety shoes are best for it, don’t hesitate to contact us using the contact information below. Certain safety shoes protect against electrical charges—two of which are electrical hazard and static dissipative. These standards are set by the American National Standards Institute and the American Society of Testing and Materials. Specialty work safety shoes, when dealing with static electricity, must meet the provided standards to be certified and worn while working around electricity. This article will cover the differences between electrical hazard and static dissipative safety shoes. Shoes and boots with protection against electrical hazards must meet the American National Standards Institute standard ANSI Z41 PT99. This standard protects against hazards from open electrical circuits. Safety shoes that protect against electrical hazards are frequently needed in jobs in or involving electrical engineering, welding and maintenance; or with any other job where an employee has the chance to be exposed to electrical hazards and currents. The shoes themselves are designed to reduce electricity through blocking it, and therefore protect against electrocution. Since the barriers are located in the soles and impede the current from the ground, this differs from static dissipating safety shoes because they are built to reduce the amount of static electricity that has already built up around your body. Static dissipating safety shoes must meet the standards outlined by American Society for Testing and Materials, ASTM F2413-05. As mentioned, they reduce the static electricity that has already built up in and around your body—to do that, they actually conduct electricity through the insole and shoe lining and then transfer it to the ground—whereas electrical hazard shoes are designed to block the electricity in the first place. These shoes are normally worn by people who manufacture units such as computer components or explosives, for example. We have several safety shoes in stock that protect against electrical charges and dangers when working around electricity. Look for the symbol to find safety shoes that protect against electrical hazards, and the symbol to find static dissipating safety shoes.